Eastertime! 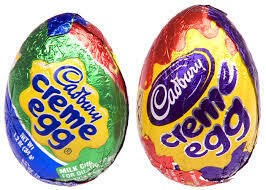 What booze pairs best with a Cadbury creme egg? Frangelico and Peeps? Wine and jelly beans? Port and Cadbury creme eggs? Easter candy is dandy. But Easter candy paired with booze? Now that’s something to put a spring in your step. So we asked wine and spirits connoisseurs to come up with something the adults can sip on while the youngsters hunt for sugary splendors in the grass. Wine and chocolate can be a tricky pairing. But wine and fruity jelly beans? That can work. Austin Hope, president of the Paso Robles’ winery Hope Family Wines suggests a glass of Treana white wine with a handful, or two, of jelly beans. The wine is made up of equal parts marsanne and viognier grapes and has hints of almond and honey. Paired with fruit-flavoured jelly beans — juicy pear, orange, peach or lemon — the wine’s crisp taste cuts through the sugary sweetness of the candy. Or if black licorice jelly beans are more your style — Somebody must eat those things, right? — try them paired with a late bottled port.